At Musicworks keyboard and guitar lessons start from as little as £26 a month. For this price your child will get a half hour lesson and will be taught as part of a small group with three other pupils. 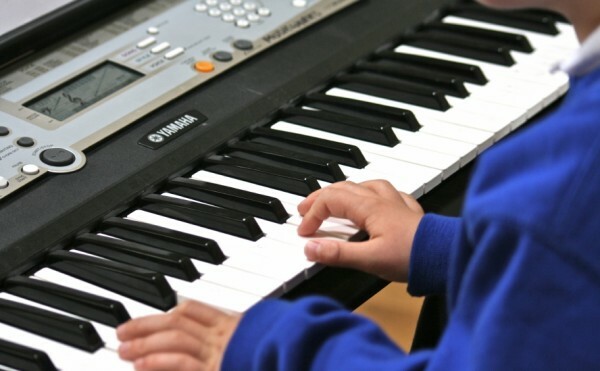 If there are not enough keyboard or guitar pupils in your child’s school to make up a group of four then the lesson duration will be amended as follows: three pupils – 25 mins, two pupils – 20 mins, one pupil – 15 mins. To opt for our cheapest lessons at £26 per month, simply ‘tick’ beside ‘Group of 4, 30 mins’ on our keyboard and guitar application form (in the lessons field) and choose to pay via ‘payment method 1’. Smaller group options and individual options are also available. Please see our keyboard and guitar prices for more information. Drum lesson prices start from £32 a month for a group of two pupils for 25 minutes. Individual drum lessons start from £35 a month for a 15 minute lesson. Ukulele prices start from £4.30 per lesson. We aim to deliver a minimum of 34 lessons per academic year. Lessons are generally paid for by the parent or guardian of the child taking lessons although there are certain instances whereby some of our schools have arranged to part fund the cost of tuition. Payment of the lessons can either be spread over the course of the year and paid by monthly ‘standing order’ bank transactions or can be paid by cheque for each terms lessons in advance. Apply.